Igglybuff in game: 9,613 Who? Important notice! Pokemon Igglybuff is a fictional character of humans. 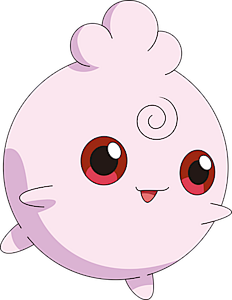 Igglybuff (Japanese: ププリン Pupurin) is a dual-type Normal/Fairy baby Pokémon introduced in Generation II. Prior to Generation VI, it was a pure Normal-type Pokémon introduced in Generation II. Igglybuff twins appeared in Same Old Song and Dance. These Igglybuff were owned by a girl named Brittany and were practicing for a concert. 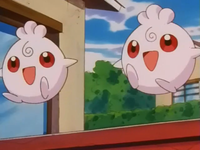 Jigglypuff was jealous towards the Igglybuff twins as they were stealing its audience. An Igglybuff appeared under the ownership of Normajean in The Brockster Is In!. Igglybuff was first seen as one of the Pokémon in the Pichu Brothers' Possé in Pikachu & Pichu. Two Igglybuff appeared in Hungry For the Good Life!. Three Trainers each owned an Igglybuff, which appeared in The First Day of the Rest of Your Life!. Whitney owns an Igglybuff, which she used to battle (what she thought was) Suicune when she visited the Mahogany Gym. Its Sweet Kiss provided an opening for her Miltank to attack the creature, but failed when the moving ice sculpture felled Miltank and forced it to team up with Pryce's Swinub. An Igglybuff appeared in The Last Battle XIII as one of the Pokémon sent to help the fight in Ilex Forest. Igglybuff is tied with five other Pokémon for having the lowest Special Defense stat of all Pokémon. 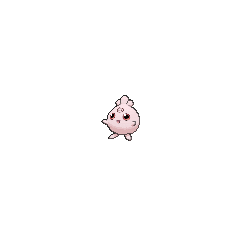 Igglybuff also has the lowest Special Defense stat of all Fairy-type and Normal-type Pokémon. 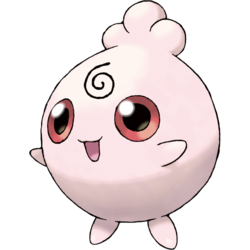 Igglybuff is tied with Cleffa for having the lowest Speed stat of all Fairy-type Pokémon. Igglybuff is the lightest Normal-type Pokémon.